Paintings: Most works are artist's oil paint on canvas (his preferred medium) with some smaller works on canvas board panels. Only superior brands of artist's oil paint are used (no unproven brands or student quality). Some paintings are quite large (eg: 1.5sq m or 16 sq ft). All paintings are sealed after completion with a high quality professional picture varnish. Canvas is primed with gesso prior to painting, and sometimes acrylic artist's paint is used as a quick background colour or tonal value prior to settling down to painting with his preferred medium, oil paint. Pastel Paintings: Mostly small to medium, using artists� quality hard and soft pastels of a well known brand (never student pastels). Pastels are not �fixed� or sealed because the sealing media changes the colour and tone of the finished work. All pastels are framed to protect the painting surface. Drawings: Are mostly black and white, many drawn directly with artists� quality Indian ink on gesso primed canvas. Many of the original �Ink on Canvas� drawings are quite large (up to 1.5 sq m or 16 sq ft), with smaller drawings mainly pencil on paper. Many of the smaller drawings have been converted to 'mixed media' originals on canvas to make them less prone to damage , to increase their size and impact as an original, and to allow the finished work to be displayed without needing to be framed behind glass. Some of the drawings displayed have not yet been finally converted to mixed media, which means that in some cases the suggested size can be changed before completion if a client wants the final work to be larger or smaller. All drawings are �fixed� or sealed after completion. Etchings: Victor designed and constructed his own modern etching press to create his etchings (based on Norman Lindsay�s original press size and design). The etchings are limited edition numbered works from single or double acid etched plates (both colour and black and white). Sculpture: All of his 16 public sculptures are bronze and were cast in his own foundry. Two of those sculptures are mixed media, mainly bronze but also incorporating sections from 316 stainless steel, toughened glass, fabricated copper or brass, and concrete. All materials used are chosen to last a very long time with minimal maintenance. Many of the works are quite large, up to 8 metres high and 21 tonnes weight. Two large sculptures incorporate water (fountains) and one of those is a water driven mobile sculpture. His current sculpture creations consist of smaller pieces, �limited editions� cast in either bronze or other stated mediums with long lasting qualities (eg: polyester, concrete, acrylic, etc) and are available for purchase. Bronze patinas using traditional chemical oxiding, or other special surface finishes on non bronze media are all designed to last and enhance the works. 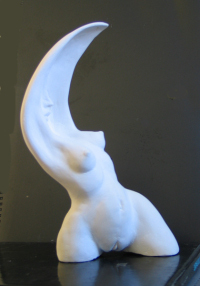 The acrylic casting of his work, a recent development, is done for him in a specialised USA sculpture foundry, and the effect of the water clear medium, much clearer than glass, is uniquely beautiful, allowing the viewer to see the opposite side of the sculpture through its own interior whilst still viewing the exterior surface being viewed. Mixed Media: Most of Cusack�s paintings are derivatives of his earlier works, often developed by exploring a philosophical idea or an attractive form to a higher level, or often combining ideas from two or more of his own paintings. A small percentage of his paintings these days use a digital technique to explore the final painting structure (before actually applying the brush) by combining high resolution scans of two of his already completed originals in various states of transparency and size until the result is approaching his desired effect. The result is then produced in very high quality permanent pigmented inks on canvas to the size of the finished work, and the work then finished by painting directly with artists oils. This technology is not new and is accepted widely nowadays as authentic original art by art galleries, commercial and public. The basic discipline Cusack applies is that all his mixed media paintings are identified as such, and are derived only from his own original images directly sourced from his earlier paintings or drawings. The process is somewhat like what is sometimes called �Giclee�, but superior in its source and production materials. The digitalised canvas produced is then used as the base for final painted adjustments, modified and finished using artists oil paint and a long lasting picture sealer. Victor�s work often mixes media within a specific work, other examples being pen and wash, or an oil painting over a thin acrylic background on a gesso undercoat, or Indian ink or art pen on canvas, sometimes with an aquarelle or coloured ink wash, ink on oil or oil on an ink drawing, etc, but only using compatible long lasting materials. Some of the working drawings including live model and on site sketches are converted to larger mixed media works on canvas, making them less prone to damage, also increasing the sketch size and impact as an original, and to allow the finished work to be displayed without needing to be framed behind glass. Copyright � 1962-2008, Victor Cusack. All rights reserved. Use of images prohibited unless by express written permission.